Vornhiem is almost universally acknowledged as a great city supplement, and it is, but the new city supplement from Hydra Press, Fever Dreaming Marilinko, set in Chris Kutalik’s Hill Cantons (what the Grand Duchy of Karameikos should have been) is an entirely different kind of great city supplement. Where Vornheim, and the old Judge’s Guild city supplements, aspire to offer means of creating ‘a’ fantasy city, Marlinko seeks only to create ‘the’ city of Marlinko, and does so in the form of a set of adventures, personalities and factional rivalries that create a city ready for conflict and picaresque shenanigans. In some superficial way Fever Dreaming Marlinko resembles the classic B-Series Module “The Veiled Society”, in that it presents a series of small urban adventures focused around the factions within an urban environment. Marlinko is far better than Veiled Society in that it is not overly proud of its cleverness (nor does it’s cleverness consist of gimmicky cut-out buildings), and it takes the time to make a city that isn’t simply a dull pastiche of fantasy cities. Marlinko does follow Veiled Society’s lead in making the city a place for adventure far more than it is place for resupply, investment or carousing between adventures, focused on faction conflict that offers opportunity and danger, but it does so without the B-series stalwart’s dependence on a railroad, or mechanics that force certain outcomes. Mr. Kutalik is a good Game Master (I speak from one experience playing in Marlinko with a one handed elderly thief who really didn’t appreciate the murder-hobo nature of the standard adventure, but his written material is uniformly excellent) of the “OSR” or perhaps “open-world” variety: focused on player driven narrative, emergent world-building, random setting enhancing events and the creation of a game world that offers a wealth of potential adventures without any pre-judgment of character and player ability, goals or morality. Fever Dreaming Marlinko is a worthy product of this mindset, and written with this style of play in mind - there are no overarching plots, but rather plots aplenty, fomented by a variety of factions and ripe for player character participation, and best none are pressing. This lack of a pressing timeline and the abundance of other potential adventure hooks are what separate Marlinko from a city themed adventure and allow it to be a city supplement, in that these hooks, complications, NPCs and small adventures await multiple visits and returns by the players. Fever Dreaming Marlinko is a setting book in many ways, it lays out the city of Marlinko, a small walled city that acts as a cantonal capital for one of the Hill Cantons and is relatively near to the Ursine Dunes (of Hydra Collective’s recent project). There is little historical detail in the product, and none of the sort of history and setting backstory that one finds in many older gazetteer style game books. This isn’t to say that Marlinko lacks backstory, only that it’s lightly sketched in the basic setting material and only really comes out through random encounters rumors and detail. 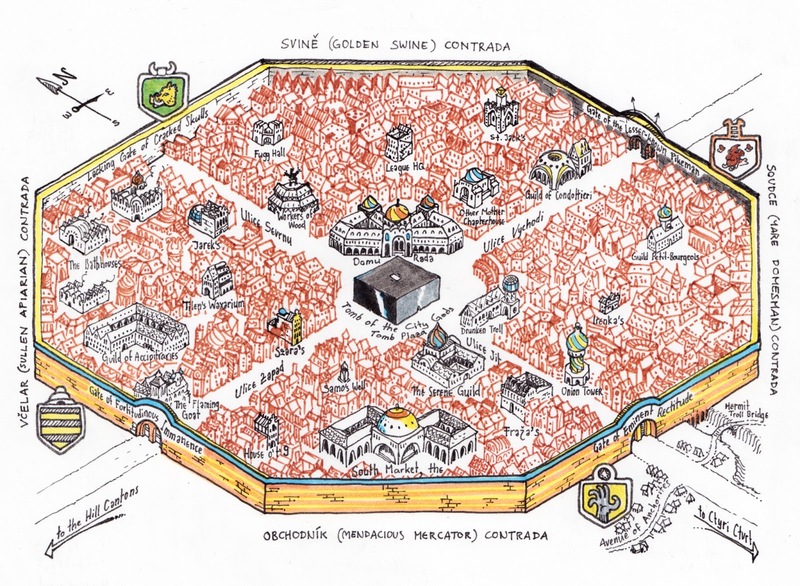 Each of the quarters takes its general feel and purpose from its god: a wealthy enclave (where the characters can frequent bathhouses or engage in tiger wrestling matches), a business district, an industrial slum and the residential district. Each district has its own important NPCs (usually faction leaders), random encounters and carousing table. These features, which link well together with rumors, chance meetings and carousing events naturally leading to encounters with, grudges against and commissions from the city’s various important NPCs and ultimately into one of the two smaller adventure locales in Marlinko or out into one of the Hill Canton’s other published (or soon to be published adventures). All of this detail is very flavorful, eclectically so in the charming, off-kilter quasi Slavic weird-fantasy way that seems the mark of Hill Cantons products. Wizards all have a bit of the insane and preposterous rather than a grave bathos about them, and the random encounters tend to be less dangerous and more charmingly absurd (pedants potentially about theology arguing with an escaped, drugged tiger) but with potential cascades of consequences (killing the sleepy tiger will lead to making an enemy of its owner who runs a tiger wrestling dome). These interconnected subsystems for city adventure: random encounters, faction/NPC lists and carousing tables provide more details then most setting supplements while omitting the wealth of useless mundane details that one finds in the worst sort. This mechanism of introducing evocative details seems designed for use at the table and minimum GM prep time, given that everything evolves fairly naturalistically from the brief descriptions of the tables. Knowing the basic factions of Marlinko and reviewing the potential dungeon adventures within (see below) is helpful, but the city should be able to spiral off its own adventures based on player whim - want to hire henchmen, but tend to murder them? You will end up facing a picket line of off-duty linkboys and eventually perhaps even the dangerous Wobbly-Giant. This sort of complication and consequence system should make engaging in even mundane adventure outfitting activity in Marlinko amusingly treacherous, while creating an abundance hooks and rumors, but it’s not to say that the supplement isn’t without some of the traditional city supplement essentials: equipment & services lists, locations of note and random building lists. However these offerings tend to be sparse, even skeletal, as the city book assumes that the GM will have a firm grip on these sorts of basic play techniques. For example, the Marlinko equipment list focuses on the city’s more unique offerings in clothing and omits all the unnecessary equipment costs for things like rope. There are plenty of other useful additions in Marlinko: a corrupt justice system and rules for tiger wrestling being my favorites. The basic pretense of Marlinko is that the four contradas (quarters) is dedicated to one of the strange demigods that are said to dwell in the black cubic temple at the center of town and the contradas of the city express their worship largely through a rivalry centered around an annual race with convict jockeys. 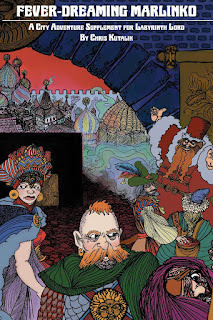 There are two sub-adventures in Marlinko, both written with explorations, raids or escapes in mind and both represent the lairs of the city’s more dubious factions. The first is the townhouse and small dungeon of a sinister vampire socialite, who in both murderous and in league with the sinister Eld (Hill Canton’s ubiquitous space elven villains). The second the exploration of the very strange and messy catacombs of “The Church of the Blood Jesus”. As adventures go the first is better than the second, for a very particular reason that I find sometimes glares a bit in Hill Canton products. The Hill Cantons is a long running campaign, still actively played, and its players and their characters have marked the world rather greatly. The Hill Canton products use these changes and the past adventures to create setting detail and often this is interesting enough, but sometimes it feels somewhat off. The Church of the Blood Jesus was the product of several gaming sessions where on character was a drunken time and space lost 19th century Irish Priest with a poor grasp of doctrine. 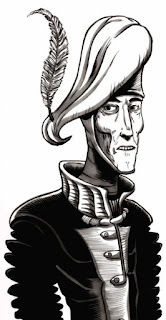 The character left behind a henchman convert and in the ongoing game this henchman founded a church that persists with all the silliness that the original player brought to his characterization. Hence Marlinko has the very gonzo, and very unslavic “Church of the Blood-Jesus” as an adventure locale. The catacombs themselves are interesting, as are the church doctrine and it’s cannibal nun-meneads but the who thing doesn’t really fit and the catacombs are somewhat off in tone and content from the rest of Fever Dreaming Marilinko – less psychedelic Eastern Europe and more vaguely churlish religious joke. The manse of Lady Sazra the vampire is really an excellent site adventure – it feels a bit like a horror movie and Sazra herself is quite dangerous, as is the Eld envoy who may lurk here if the town chaos level (An ingenious Hill Canton’s subsystem that makes player actions and inaction slowly effect the stability of the game-world) but the dungeon and townhouse don’t seem especially dangerous for the 2nd to 4th level characters that Marlinko claims to be designed for. For example, ghouls, zombies and wights in small numbers are relatively harmless to any party with a 3rd Cleric (or a lucky 2nd level one) and I can’t see a single 2 attack guard dog with AC 4 and 30HP surviving more than a round against a party of 2nd and 3rd level adventurers. Sazra isn’t even a real 8HD weapon immune vampire, but rather a 9HD “strigoi” that can cast a couple of spells (including sleep, but not web) and is hard to kill permanently, but easy enough to hack down in a round or two if the party exhausts spells and gets the drop on her. This is hardly a serious quip, and the feel and level of naturalism in these adventuring locales is excellent. The monsters are characterful, the traps make sense both in mechanism and placement and description generally pretty strong. Treasure is the only weak point, being too reliant on coinage, but even here some effort is made to describe the various coin hoards, and there are other treasures about – though Lady Sazra’s mansion in particular seems like a wasted opportunity for more incidental treasure in the form of furnishings and art objects. 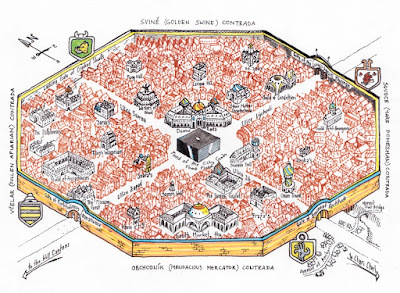 The maps are also fantastically good, drawn in a colored isometric style that captures a fair bit of room description as well as being very fun to look at. Marlinko’s art is also of very high quality, both slightly cartoonish drawings of NPCS that are characterful and amusing and the more artistic ink and scratchboard pieces that illustrate the adventure locales in small numbers should be useful in play as visual aides (especially the NPC sketches), as well as being very evocative of the setting. The descriptions I have given and the humor of Marlinko, something also found in Slumbering Ursine Dunes (Hydra Collective’s flagship, Kickstarted project that encouraged Marlinko’s publication) are a bit flippant and irreverent when compared to the standard tone of gravitas that many fantasy adventures take. There are plenty of jokes in the text, as well as Gygaxian esoteric phrases, and while I find these jokes funny, some less well-humored reading might become annoyed by them. Likewise there’s an element that could be considered ‘gonzo’ in all of Hill Canton’s setting, and this persists in Marlinko, but the fundamental cohesion of the setting keeps this from being absurd. Marlinko and Hill Cantons more generally have weird, non-classically fantasy elements that are presented in a lighthearted manner. As with all good versions of such setting elements Marlinko presents the bizarre with absolute seriousness for the characters. I wouldn’t really call Hill-Cantons and Marlinko “gonzo”, there’s some level of tongue in cheek absurdity missing, but I would certainly say that it is a setting with strongly psychedelic feel that promotes picaresque play. Fever Dreaming Marlinko is really an excellent supplement, it doesn’t need changes really, unless one were to use it in a non-Hill Canton’s setting, and then it would have to be changed a fair bit. I would turn Blood Jesus into something that was less of a past campaign in-joke, and perhaps beef up some of the encounters. Other than that this is really a model of what a good urban supplement should look like, and many of the tricks it uses to create evocative and interactive setting are worthy of emulation in any campaign. Thanks for this, Gus. I was remarkably tardy and just ordered my print copy of this today (and, tardily, am catching up on your blog). I think I can fit this into my Hyperborea game. If anyone's gonna like tiger wrestling, my players are gonna like tiger wrestling. And Chris's stuff, I find, is really adaptable. I think my players didn't stay as long in the Slumbering Ursine Dunes as I thought they might when I put it in Hyperborea, but decisions they made there are still echoing down the game.